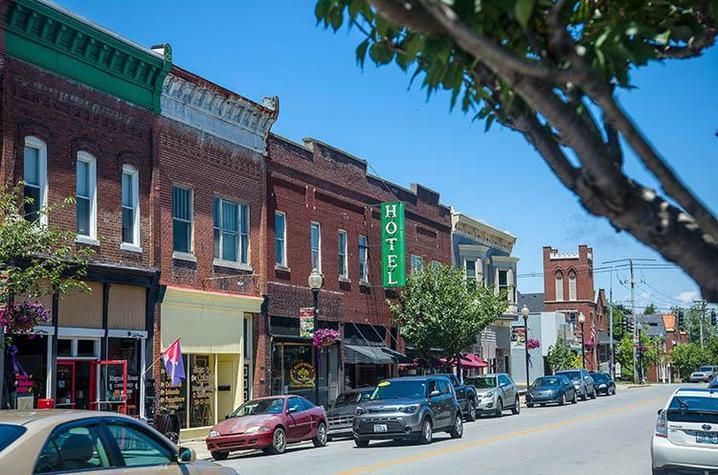 Downtown Lawrenceburg, Kentucky. Photo by Matt Barton, UK Ag Communications. LEXINGTON, Ky. (Nov. 28, 2018) — Urban forestry professionals and University of Kentucky College of Agriculture, Food and Environment students will gather for a panel discussion and community forum, Seeing the Forest Through the Trees, tonight (Wednesday), Nov. 28. The free forum, which will focus on how tree inventories can help urban forest management, will take place 7 p.m. EST, at E.S. Good Barn, located at 1451 University Drive on the UK campus. A reception with light refreshments and exhibits will precede the forum at 6 p.m.
During that hour, students majoring in natural resources and environmental science, as well as landscape architecture, will present the results of their tree inventory projects, as part of the college’s new Introduction to Urban and Community Forestry undergraduate course. Speakers will include Bridget Abernathy, of the Kentucky Division of Forestry; Jenny Gulick, of Urban Canopy Works; John Saylor, of Lexington-Fayette Urban County Government; and Nic Williamson, of the Urban Forest Initiative, part of the UK Tracy Farmer Institute for Sustainability and the Environment. The event is sponsored by UK, the Tracy Farmer Institute and the U.S. Department of Agriculture. Free parking is available at E. S. Good Barn. Reservations are not required. For more information, contact Ellen Crocker at e.crocker@uky.edu.